HBO has today confirmed that their upcoming HBO Films presentation The Immortal Life of Henrietta Lacks, will debut Saturday, April 22 at 8:00pm ET/PT. 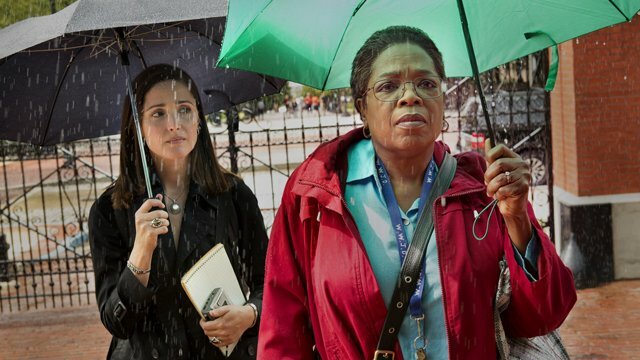 Based on author Rebecca Skloot’s critically acclaimed, bestselling nonfiction book of the same name, The Immortal Life of Henrietta Lacks stars Oprah Winfrey and Rose Byrne. The film tells the story of Henrietta Lacks, an African-American woman whose cells were used to create the first immortal human cell line. Told through the eyes of her daughter, Deborah Lacks (Winfrey), the film chronicles her search, with the help of journalist Rebecca Skloot (Byrne), to learn about the mother she never knew and understand how the unauthorized harvesting of Lacks’ cancerous cells in 1951 led to unprecedented medical breakthroughs, changing countless lives and the face of medicine forever. Rebecca Skloot’s The Immortal Life of Henrietta Lacks, which took more than a decade to research and write, instantly hit The New York Times bestseller list upon publication, and remained there for more than four years. The Immortal Life of Henrietta Lacks is directed by Nights in Rodanthe‘s George C. Wolfe directs from his own adapted screenplay. A Your Face Goes Here Entertainment, Harpo Films and Cine Mosaic production, The Immortal Life of Henrietta Lacks is executive produced by Oprah Winfrey, Alan Ball, Peter Macdissi, Carla Gardini and Lydia Dean Pilcher. Henrietta Lacks’ sons David Lacks, Jr. and Zakariyya Rahman and granddaughter Jeri Lacks serve as consultants on the film. Are you planning on checking out The Immortal Life of Henrietta Lacks on HBO this April? Let us know in the comments below!